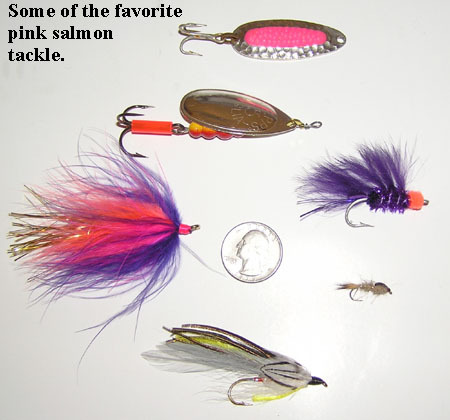 Pink salmon are a plentiful game fish that are great for kids and beginning anglers. They are an excellent fly fishing target. Pinks can be a bit leader shy and can challenge your fighting skills on light tippet. Pink salmon are accessed in freshwater by traveling by boat from the lodge to nearby estuaries and rivers. Once on the scene, fishing is done by wading and walking along the banks. Freshwater pinks are taken with fly, spin and bait-casting gear. The pink run on Kodiak Island is one of the world finest and double figure days (10+ pinks) are commonplace. 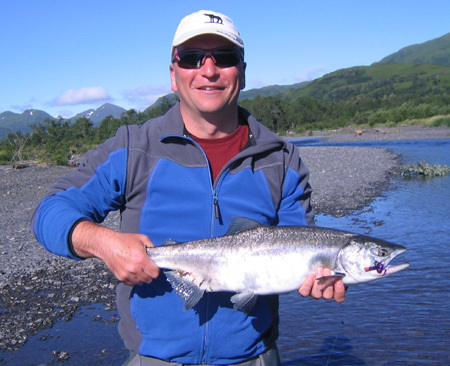 Kodiak’s pink salmon average 4 pounds and some have exceeded 8. Freshwater pinks are available from July to September. The best fishing is in July and early August.